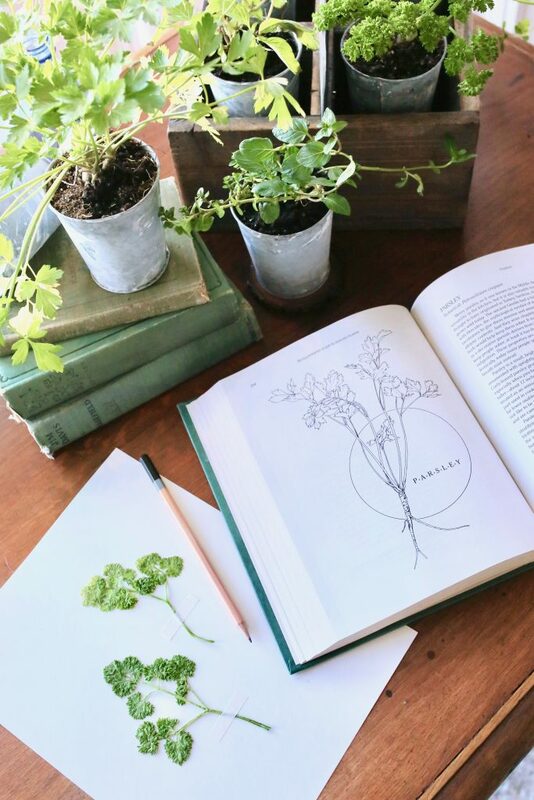 Since I was a little girl, one of my favorite things to do in the Spring time is to press plants in between stacks of old books. Growing up in the country, there was always an abundance of wildflowers in the pasture and along the county road where I lived. 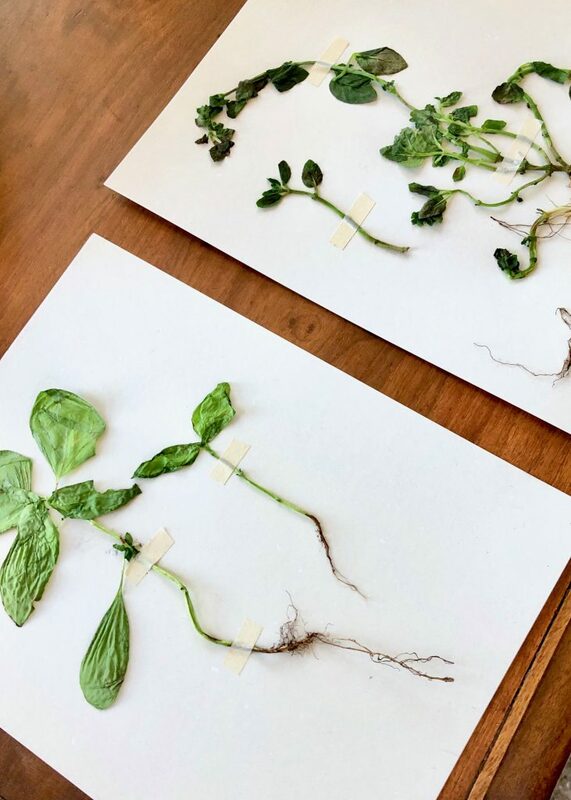 Pressing plants and flowers became a favorite past time in the spring and summer months. For instance, I remember collecting wild flowers for a middle school science project. In addition, my neighbor gifted me a couple of flower identification books that helped me learn the names of many plants native to Texas. 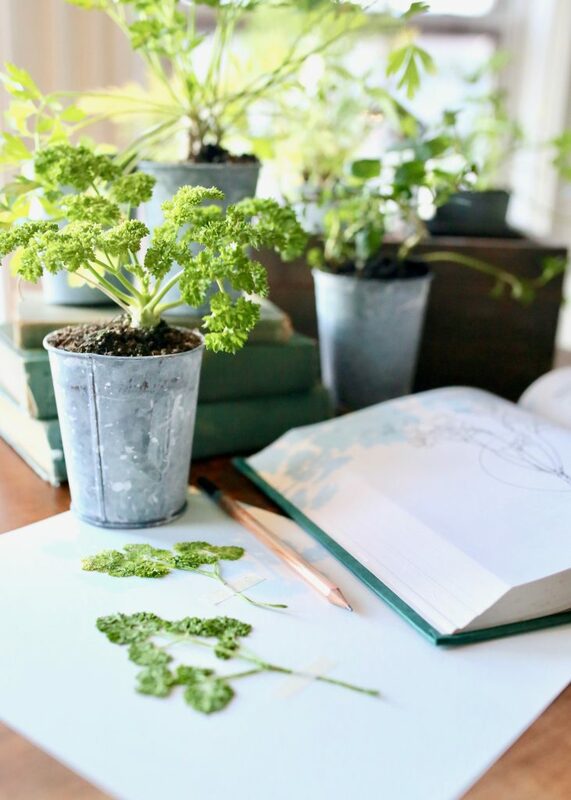 With this easy pressed plant DIY, you can learn how to press plants, flowers or herbs and capture the essence of Spring for months to come. 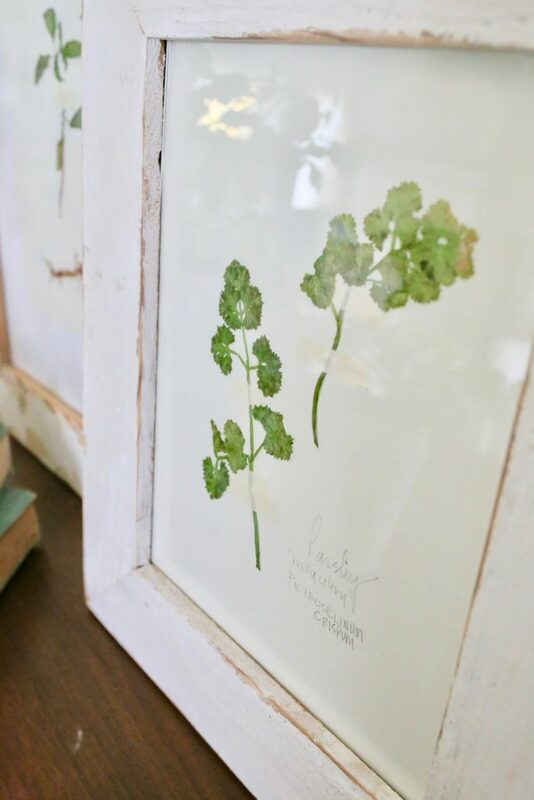 This year, instead of wildflowers, I decided to press herbs into beautiful wall art. 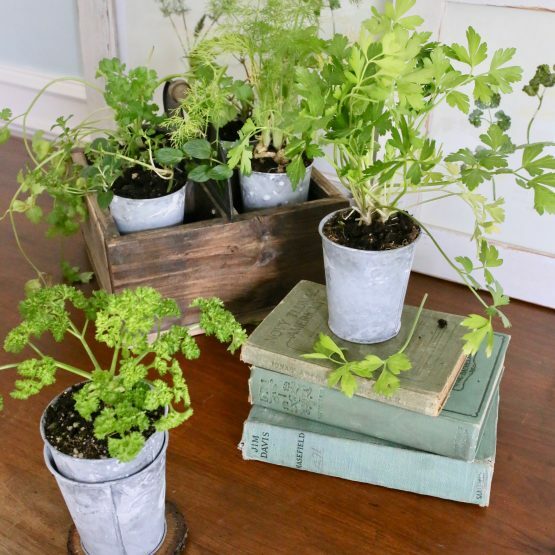 I featured this easy pressed plant DIY in the current issue of Modern Texas Living magazine. 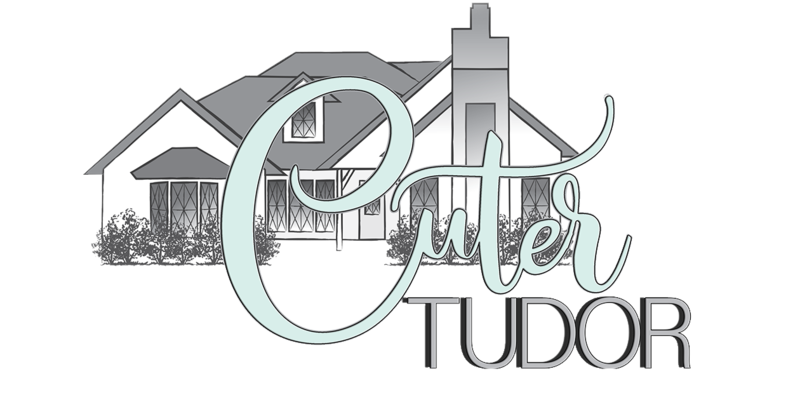 Certainly, check out the article and more in the online magazine at ModernTexasLiving.com. With a magazine deadline fast approaching, I did not have weeks to wait for the herbs to flatten, so I found a way to press plants in a matter of minutes! The key is the microwave oven! 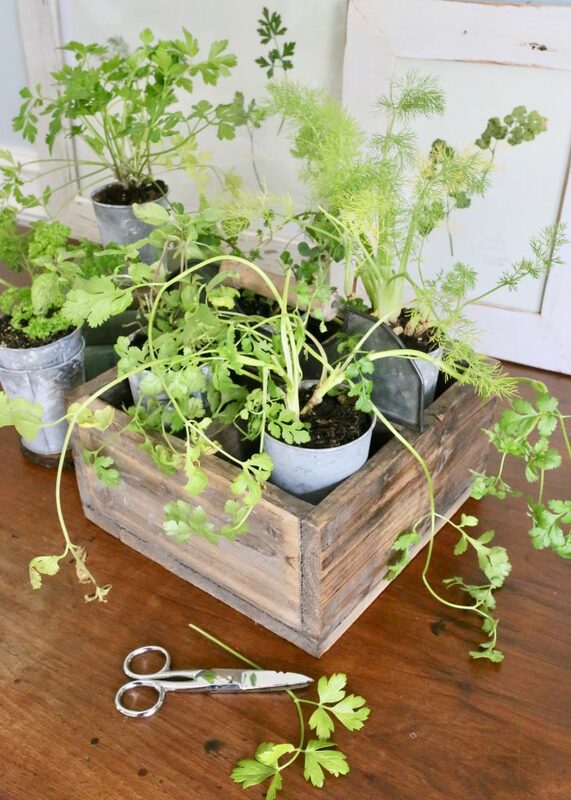 Whether you intend to press leaves, flowers or herbs, I believe that this pressed plant DIY will become your next favorite spring time activity with kids. 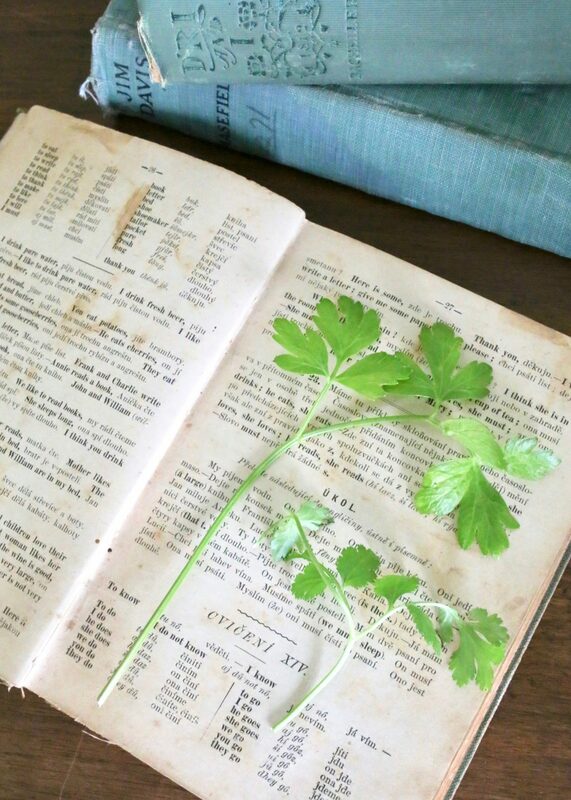 You can press most plants with items from your kitchen, vintage books and the microwave oven. Therefore, it is fun to experiment with a variety of techniques, but just ensure you are being safe and only using microwaveable items in the microwave oven. To get started, gather your materials. Here is what you will need for DIY Pressed Plants. First, gather and cut your plants. This can mean that you cut herbs from your garden, take a walk to collect wild flowers or pick up a bouquet of flowers from the florist. Plants can be pressed with or without the roots. Remove any unwanted blemishes, leaves and or the roots with garden scissors. If you use the roots, shake any excess dirt off and rinse thoroughly. 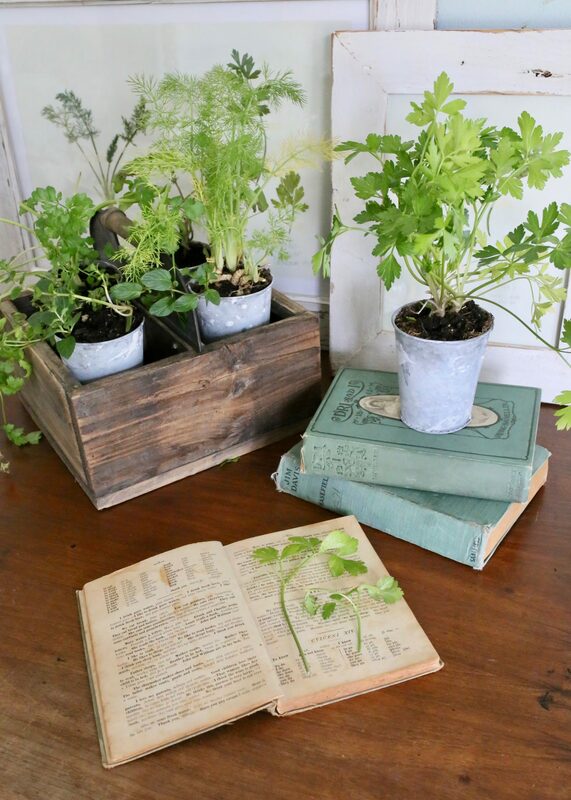 Next, arrange plants face up in the pages of an old book. You want to place the plant the way that you want it dried. Therefore, pay attention to the way the stems, leaves or petals face and lay. Then, close the book. NOTE: Ensure that the book is adhered with glue and not staples or any kind of metal before placing a book into the microwave oven. After that, place the book in the microwave oven in 30 second increments. Meanwhile, you can place microwave safe bowls on top of the book to weigh it down. Each plant is different, so you may have to work with timing. Some herbs were flattened in 30 seconds and some took 1.5 minutes. However, I do not recommend leaving the book in the microwave for longer than a minute at a time. I did not try that, so I only want to recommend techniques that safely worked for me. OPTIONAL: You can sandwich the plant between two pieces of parchment paper or a folded paper towel to draw out moisture. However, it is not necessary. Old book pages will draw out the moisture either way. Laying the plant between parchment paper or a paper towel between two plates also works. I actually misted the paper towel with water prior to microwaving it so that there was some moisture. To clarify, I just wanted to be on the safe side and ensure the paper towel didn’t burn by applying heat repeatedly. 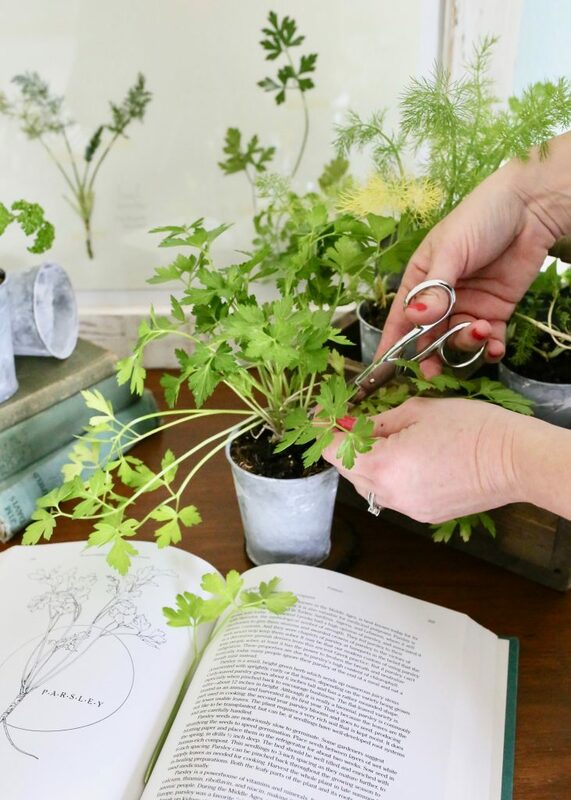 After heating, wait a few seconds for the plant to cool before opening the book and trying to remove it. The plant will be very delicate. Therefore, sliding it on paper to keep it well supported works best. Masking tape or spray adhesive works to hold the plants onto cardstock. Lastly, label the flower or plant with its common and or scientific name. Use a plant identification book or google to identify any unknown plants. 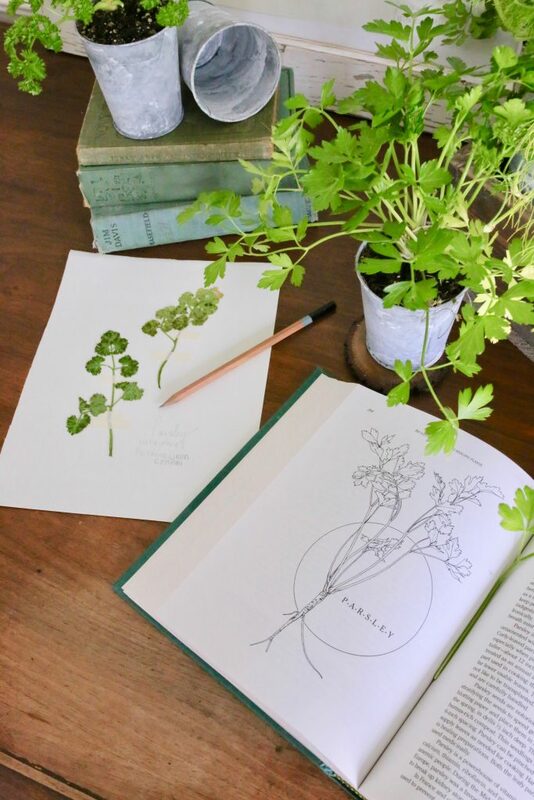 In addition, I wrote the names of the plants on the card stock with pencil, but you could use a thin tip sharpie, or label maker depending on the style that you prefer. Ready to Display your DIY Pressed Plants! 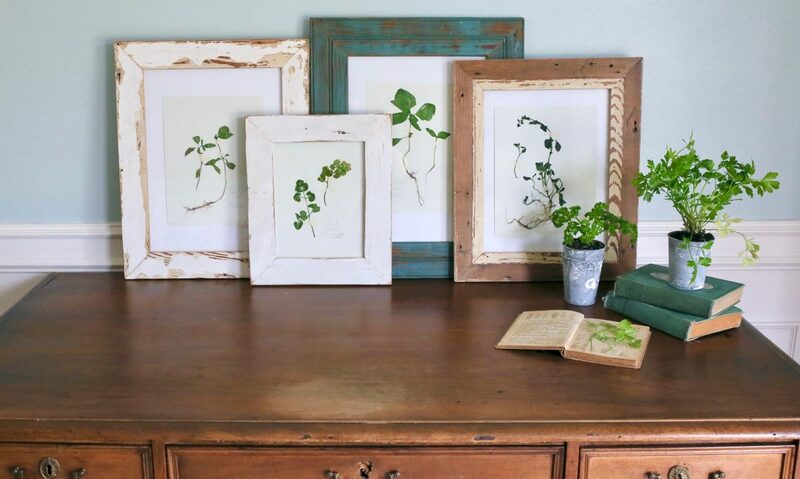 You can display pressed plants into a collection of picture frames. 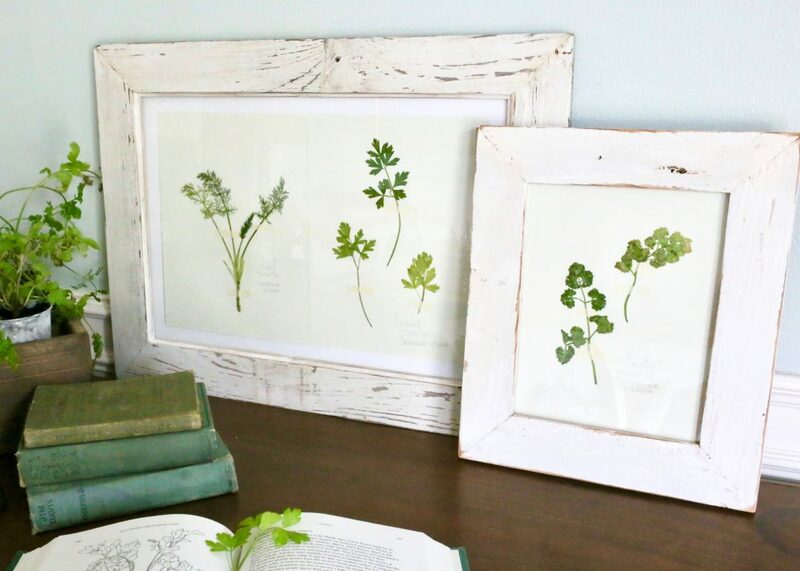 For example, I chose to frame these pressed plants in a variety of reclaimed wood frames. 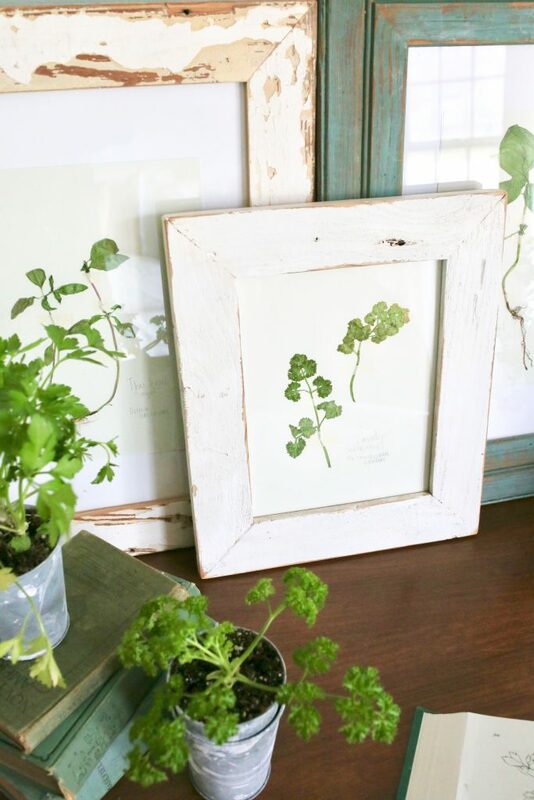 Similarly, DIY pressed plants look great in floating clear glass frames. 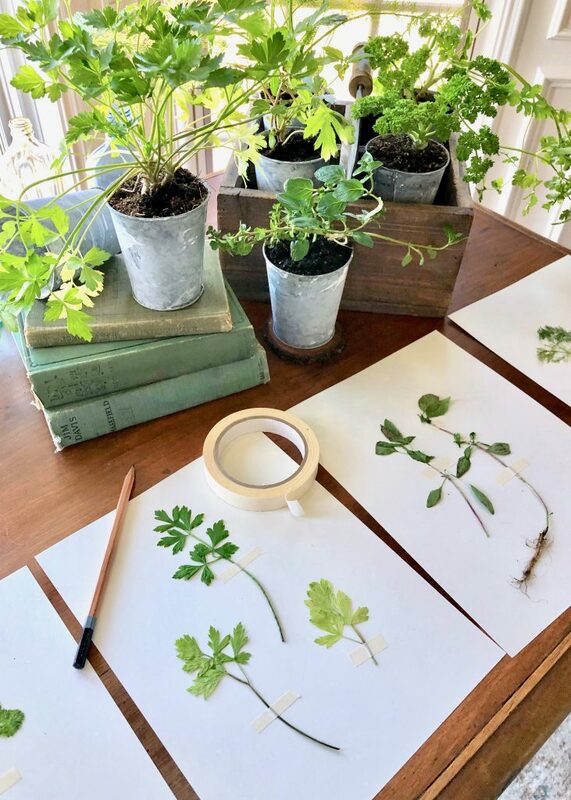 For this technique, you do not have to mount the plants onto card stock. Simply, insert pressed plants into the double sided glass frames. 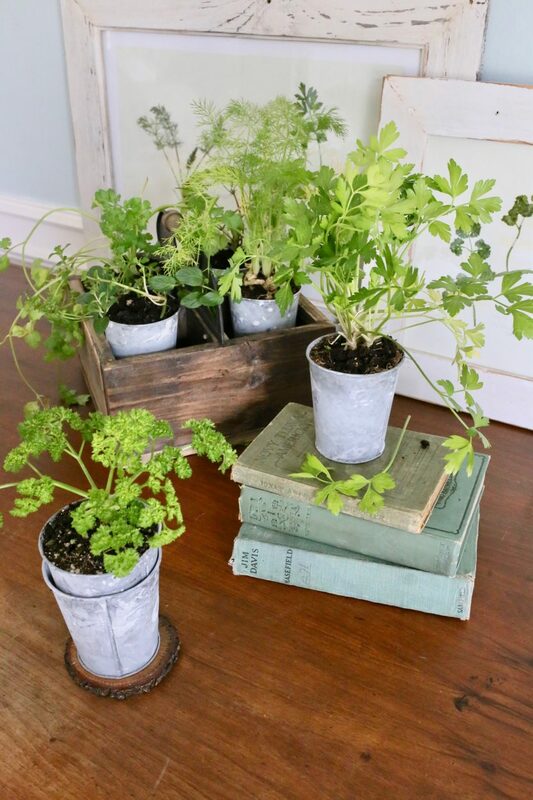 I think these pressed herbs will look great hanging in a kitchen. 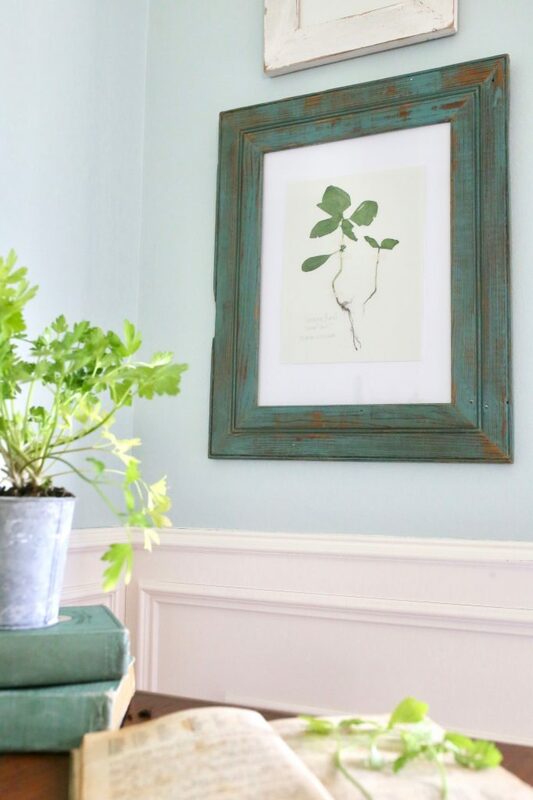 However, pressed flowers will look great in any room where you would hang botanical prints. Another suggestion is to keep your pressed flowers in a blank journal or vintage book. 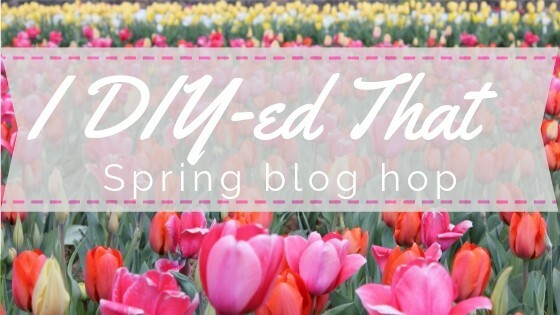 Take the Spring DIY Blog Hop! 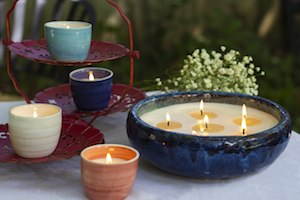 If you loved this Spring DIY, check out the rest of the Spring DIY Blog Hop! 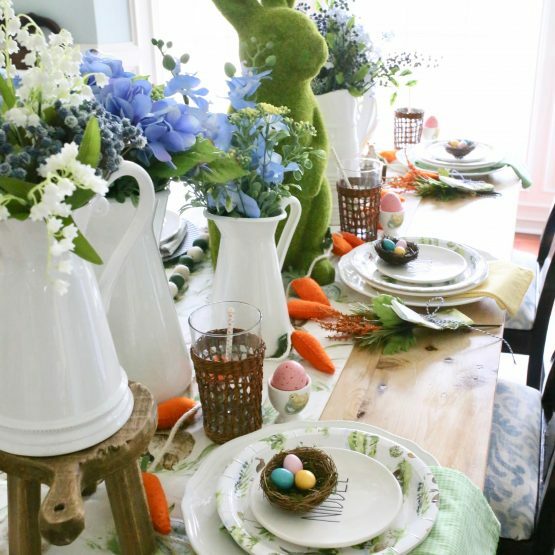 For instance, there are lots more creative ideas to help you decorate your home this Spring. 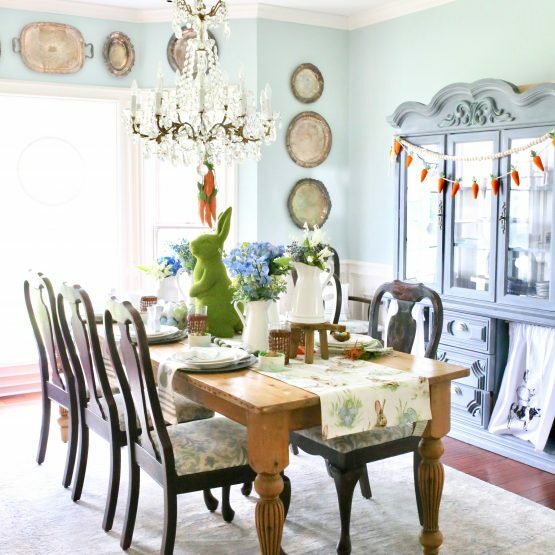 The blog hop is hosted by one of my favorite home decor bloggers, Jen at NotingGrace.com. 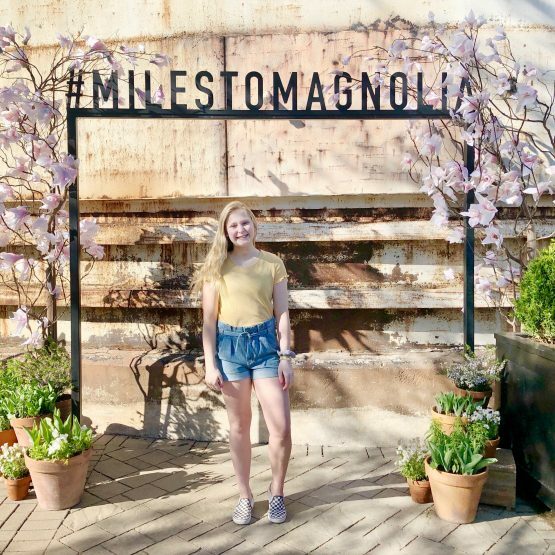 Be sure to check out her spring DIY! Most importantly, special ‘thanks’ to The Findery in downtown Waco for letting me borrow the wood tray, galvanized cups, chippy picture frames and vintage books for this project. Consequently, these items and the pressed herbs are currently on display at The Findery! Amy I absolutely love this! It brings back memories of doing this as a child with my grandma. So happy to be doing this with you. Amy! I love this DIY so much! What a great idea! I may have to use this when we redo our kitchen next month! Thanks for joining us for I DIYed that – I always enjoy seeing what you share! This is such a great idea, one I need to try! Amy!! This is amazing. Ive actually never done this before… now I’m so excited to try it with my kids. I know they will love it too! Thanks for sharing! I love how these turned out, Amy! They’re so beautiful!